The UW Department of Family Medicine and Community Health’s (DFMCH) Kevin Thao, MD, MPH, was chosen for a 2018 Wisconsin Alumni Association “Forward Under 40” Award. The award recognizes UW-Madison alumni who are outstanding examples of living the Wisconsin Idea—that the university exists to serve the public good— and this year’s honorees are particularly notable for their work to improve lives. Dr. Thao, whose family arrived in Wausau as refugees from Thailand when he was three, earned his MD and MPH from the UW School of Medicine and Public Health, and completed a family medicine residency and primary care research fellowship at the DFMCH. During that time, he was struck by how little is known about Hmong health, so began gathering data and building a body of research through engagement with local Hmong communities. 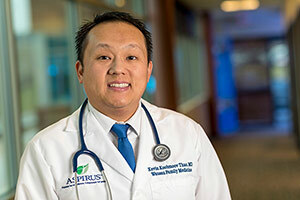 He’s now a physician-teacher at the Aspirus Wausau Family Medicine Residency Program, and works to provide culturally inclusive health care, prevent long-term disease and promote healthier lifestyles for Hmong across Wisconsin and the nation. He helped form the Hmong Health Coalition of Central Wisconsin, and collaborates with the DFMCH, the UW School of Social Work, and the local Hmong American Community Center to continue research through an ongoing survey of Hmong households in the Wausau area. Congratulations, Dr. Thao, on this honor!